While we were making our first autumn craft of the year on Monday we also added to the sensory alphabet we’re working on. Once she’d satisfied her need to do some sticking, L made some leaf rubbings using wax crayons. 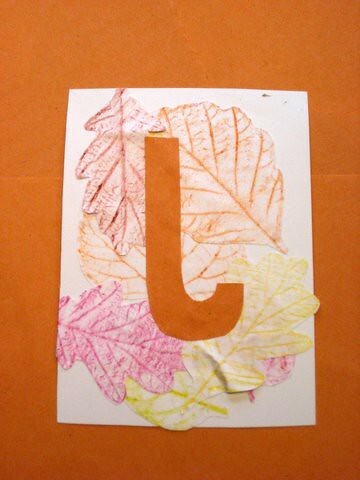 We cut them out and used them as the background for our ‘l is for leaf’ picture. 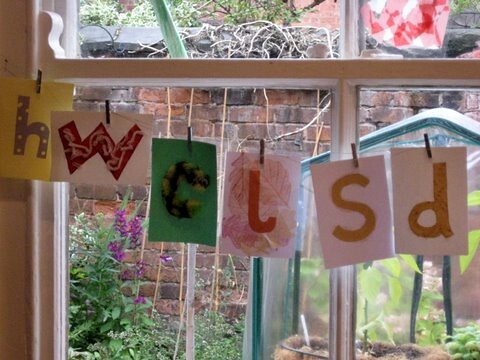 Crafting with children is such a good way to help them develop important skills: picking out all the autumn colours from the crayon pot works on classification skills, important for maths and literacy, and using scissors to cut out leaves works on fine motor skills. We also made a ‘h is for hole’ a while ago – turns out a hole-punch is fascinating when you’re 4! Here’s how out alphabet is coming along. Hope you have fun making yours Speegetti. I love this idea. I actually did this with my kindergarten kids when I was teaching in Thailand and we had so much fun making a letter a week-Wish I would have taken photos of things we did along the way though! Anyways, I can’t wait to try these out with K when the time is right. I’ve featured you today on Tot Tuesdays. Have a super week! Hi Jenn, Thanks for the feature. Yay! I like this because:our daughter is Blind and she can feel this project too. Thanks again . Mrs.Lisa griffin (MOM).